Start with a tiny hamlet - just a few huts nestled in the wilderness. Build up mines, wood cutters, quarries and clay pits, and send out scavengers to find resources from the wilds, to amass materials for further buildings. Choose your own path, selecting whether to build workshops and a market to trade, a barracks and weapons makers to recruit and equip an army, a library and mage tower to develop the wisdoms of your people, or a consulate to organise diplomatic expeditions. In time your little hamlet will grow into a thriving town, and you will have further choices to make. 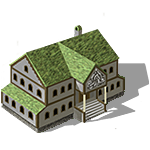 Illyriad offers dozens of buildings - more than you could build in a single town - so that each settlement grows to be unique. 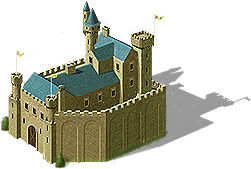 Will your town grow into a vast military camp, with parade grounds and troop quarters clustered around the barracks? Or will you fill your town with workshops, making books or saddles or arms to sell in your market? Perhaps you will build specialist mages' buildings, giving bonuses to your magics? Or perhaps darker buildings will line the streets, such as thieves' quarters or assassins' guilds? Even as your town blossoms into a vast city, there is still more to do. You can claim sovereignty over nearby wilderness areas, building farms or workshops there to support your thriving city. And you can settle, or conquer, new towns, so that your initial capital becomes just one amongst many cities which you control. From your start as guardian of a little cluster of huts, with time and planning you will become the sovereign of your own domain, with six, eight or maybe ten huge cities and sovereignty over tracts of wilderness in between, making you a power in the land.